Go ahead and give a short description of what your auctioning – this is a required field. This is what’s displayed along with the main picture on the auction post, so you want it to be short and descriptive without being too long. As a general rule – keeping it between 4 and 10 words is a good idea. Next select the location in Durham Region you’re located in or closest to from the drop down. This is also a required field. Select the category that best fits what you’re selling. This lets buyers quickly filter on categories and find your stuff easier. This is a required field. Start Price (Required): This is the starting bid for your auction and is a required field. For example, if the Start Price is $20.00 then that’s the where auction starts and what the first bid will be. Other buyers can then bid higher after this initial bid. Reserve Price (Optional): This isn’t required but gives you an interesting option – simply leave it blank if it’s not needed. This is the minimum bid that must be reached in order for your item to be sold. So, the bid starts at the Starting Price but your item can only be sold once is reaches this minimum reserve price. For example, the Starting Price is $10.00 and the Reserve Price is set at $15.00. Bidding starts at $10.00 and continues at $11.00, $12.00, $13.00 by other bidders. The auction shows the bids and also that the reserve has not been met. It’s only once the bidding reaches $15.00 the the auction is updated with “Reserve is met” and the item can them be sold. Only you know what the reserve price is – it’s not shown on the auction. This is an old strategy used by bidding sites to try and help boost bidding. Buy Now Price (Optional): This isn’t required but gives you an interesting option – simply leave it blank if it’s not needed. This allows you to set a price where a bidder can buy your item immediately at this price – bypassing the normal process of waiting until the auction ends. Once bidding passes the Buy Now prices – that option is no longer available to bidders. Again, this is an old strategy that allows you to set a price that tries to entice a bidder to buy your item right away – with the idea that it may go for a higher price if they wait until the end of the auction and there are several bidders. For example, the Start Price is $20.00 and the Buy Now Price is $30.00. A bidder can then choose to Buy Now at $30.00 without going through the bidding process to try and outbid others at the end of the auction. Only buy now auction (Optional): This isn’t required but gives you an interesting option. Checking this box only gives bidders the Buy Now option – without any bidding available. For example, the Buy Now Price is set at $20.00 and this check box is checked. Now bidders can either pay the Buy Now Price by the end of the auction or that’s it. No bidding is available. It’s generally not recommended to use this feature but can work well for smaller items that need to be sold quickly. Allow Offers? (Optional): This isn’t required but allows bidders to simply make you an offer and bypass waiting until the end of the auction. It’s recommended that you use either this option OR the Buy Now Price option since they are similar. This one is easy – just check This item does not require shipping. Biddingwarauctions.com is meant to be local to Durham Region residents and the buyers simply make arrangements to pick up the item from the seller. The idea is to keep it simple and local. No shipping charges, please. The feature is left open for potentially introducing it later. But that’s later – much later. As a general rule it’s good to set the end of auction 2 to 3 days ahead and ending in the evening between 6:00pm and 9:00pm after dinner. Stats show that’s when most people surf the internet. Also, on the weekends is when most people have free time so ending it on a Saturday or Sunday evening can give your auction the most visibility. 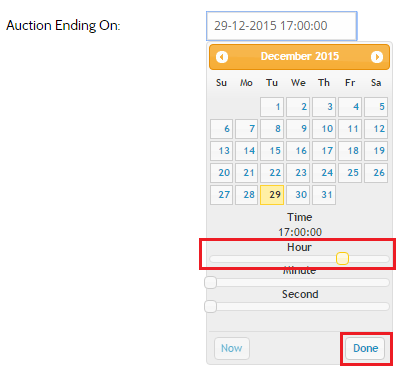 If no date and time is entered the auction end defaults to 7 days from today. Private bids allows bidders to reach out to you privately to make you an offer on your item. It’s similar to Buy Now but it’s just between you and the bidder and the bidder can offer whatever they like. Enter in your address where the item is to be picked up. At a minimum, please enter your postal code. Enter the description of the item adding as much detail as possible to give bidders a good idea of what your selling and why they should buy it. This is a required field. Checking this adds your auction to the scrolling featured auctions gallery on the home page. It’s a good idea to check this to give your auction as much exposure as possible. Add any optional tags or keywords separated by commas if you’d like to help further categorize the auction. Bidders can search by these key words in the advanced search. 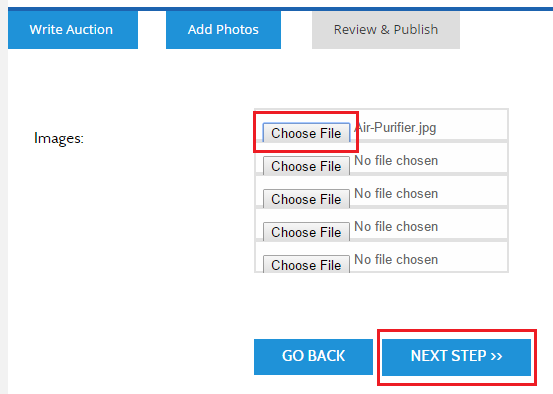 Scroll down to see what your auction will look like and then click on Finalize and Publish Item to publish your auction to the site. 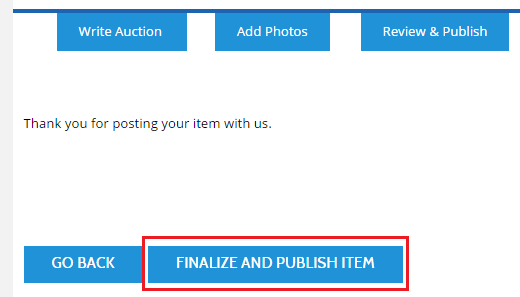 Please note that your auction will not show up on the site until the Finalize and Publish Item button is clicked. Congratulations! Your auction is now live and ready for bidders to see your auction and place their bids. You’ll be notified via email when anyone bids on your auction and once it’s ended. Once the auction ends – contact the winning bidder within 2 days to setup pickup of the item.